Molecular Phylogenetics and Evolution is dedicated to bringing Darwin's dream within grasp - to "have fairly true genealogical trees of each great kingdom of Nature." 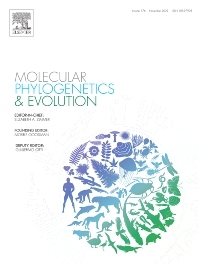 The journal provides a forum for molecular studies that advance our understanding of phylogeny and evolution, further the development of phylogenetically more accurate taxonomic classifications, and ultimately bring a unified classification for all the ramifying lines of life. Phylogeographic studies will be considered for publication if they offer EXCEPTIONAL theoretical or empirical advances. The journal encourages articles that are multidisciplinary, especially in areas, such as bioinformatics, computational biology, molecular biology, and organismic biology, that are of interest to the community of systematic and evolutionary biologists. In addition, presentations of new findings on or insights into evolutionary processes and mechanisms as expressed at the molecular level are welcome, as are those that deal with the methodology of reconstructing evolutionary history from molecular data (such as descriptions of new or more powerful computer algorithms for constructing phylogenetic trees from orthologous nucleotide or aminoacid sequences). A deeper understanding of the mechanisms and processes of molecular evolution should lead to more accurate models of molecular evolution, which in turn should facilitate the development of better algorithms for reconstructing evolutionary history from sequence data. Papers based on few taxa, single molecular markers, or that use codon-based methods to test for positive Darwinian selection, but in the absence of experimental evidence that allegedly selected amino acid changes cause an adaptive phenotypic effect, will not be accepted.